Online T-shirt orders will close on Friday, July 6, 2018. Online NARAM-60 contest registration will close Monday, July 16, 2018. NARAM-60 Rocketeer Reunion registration closes Friday, July 20, 2018. We have FAA clearance to 8,000′ AGL. If you have something big you feel like flying at NARAM, bring it on out! Registration is open online through Tuesday (www.naram.org), and you can also just pay cash at the field if that’s your preference. We are pleased to announce that NARAM-60 will include the Fly-It/Take-It program. 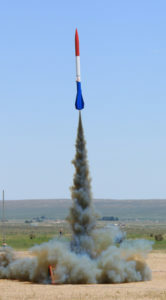 This is an excellent opportunity for the NAR community to “pay it forward” and introduce the joy of model rocketry to the next generation of rocket flier. High Power Events can be flown from Saturday, August 4 – Tuesday, August 7, 2018. Click here to download the NAR High Power Competition Rules. The NAR will host a Sport Range area. The Sport Range will be managed by S.C.O.R.E., the site host club. An FAA Waiver will be in place to fly up to 8,000′ AGL. Flights up to complex M and simple N motors can be accommodated. Pads will be available with all standard rod and rail sizes up to 1.5″ rail. A 17-foot launch tower will be available at the 1,000 foot cell for larger launches.If you need non-standard launch equipment for your project, please contact the Sport Range Manager Ben Whitfield. A number of motor vendors will be on site to take care of your motor needs. Please contact one of them to reserve motors in advance. 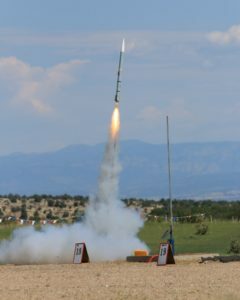 If questioned, fliers must provide evidence that any high-powered rocket that they present for flight will not exceed the 8,000′ waiver ceiling limit in effect. No one without a NARAM name badge is allowed past the spectator barrier. No one under-age or not certified for the applicable motor impulse will be allowed past the safety check with a rocket containing a high power motor unless accompanied by an appropriately certified sponsor. All igniters for high power rockets will be installed only at the pad before the flight, They must be brought to the safety check-in desk separately from, but along with the rocket. Sensitive igniters (such at “electric match” and” flash bulb” ) must be shorted out until hooked up to the range launch control system at the pad. Altimeters with ejection charges are not to be powered up until the rocket is at the pad and raised for flight . All motors must be currently certified to be flown on the NARAM field. We use FRS radios to announce our events, so bring your radios, and listen along. We are planning on having a food truck or two on the field during the week. Nothing is confirmed yet. A reminder that it is roughly 10 miles to town and a variety of eating establishments.